Today we're going to take a look at the duotone feature in Polarr. Learning this tool will open up a new world of editing photos and creating images that look like they came out of a magazine. Let's quickly learn how to apply a duotone. 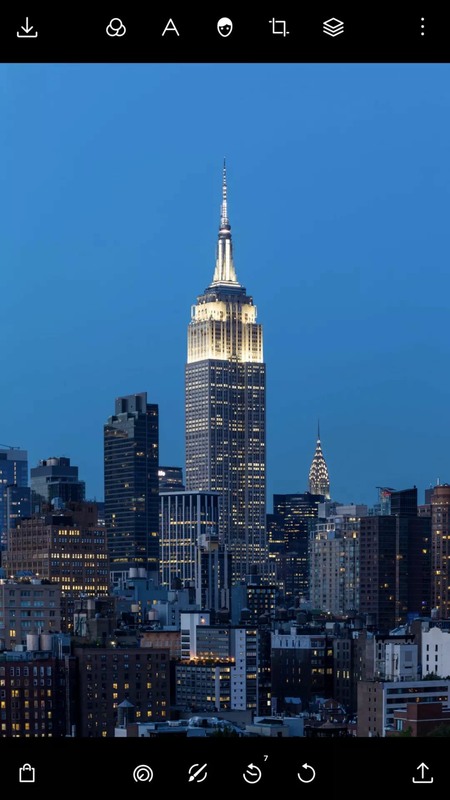 We're going to start by opening this photo of a skyscraper. To get this effect, just go to the overlay tool and select duotones. We've included a lot of presets to get you started. To recreate this specific one, select the duotone that has a blue to orange gradient. You'll then see this. Notice that the dark areas of the image are now toned blue, while the lighter areas of the image are orange. Notice when you selected the duotone preset that blue was on the left (dark tones) and orange was on the left (light tones). 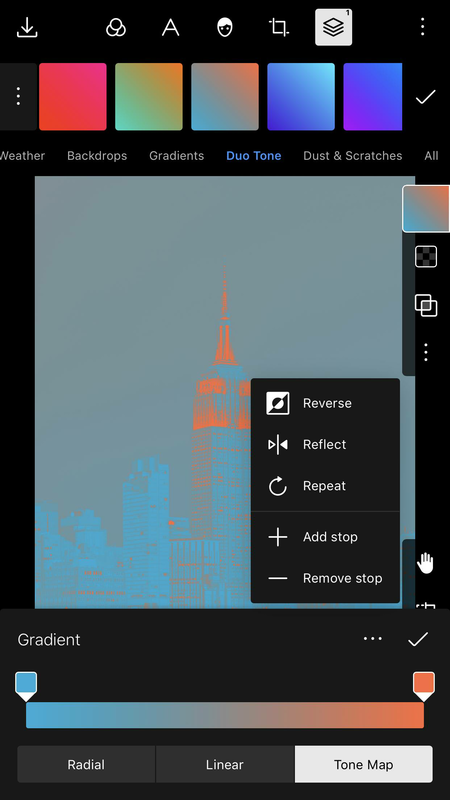 Click the top right icon to enter the duotone color editor. A duotone is essentially remapping the tones in the image. 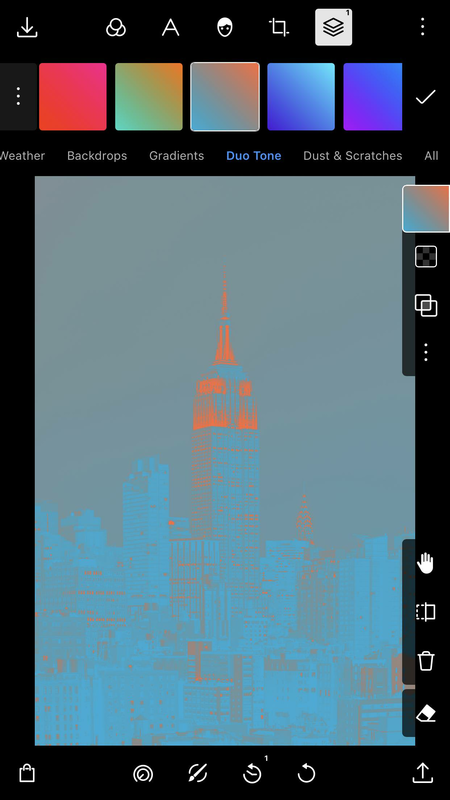 We can see that the left side of the color bar here is blue and the right side is orange. This means that the shadow areas will be remapped to blue and the lighter areas of the image will be remapped to orange. The middle area contains your midtones. What happens when you drag one of the endpoints? Here, we'll drag the right endpoint a bit more towards the left. As you see, dragging the right endpoint toward the left adds more orange to the entire image. 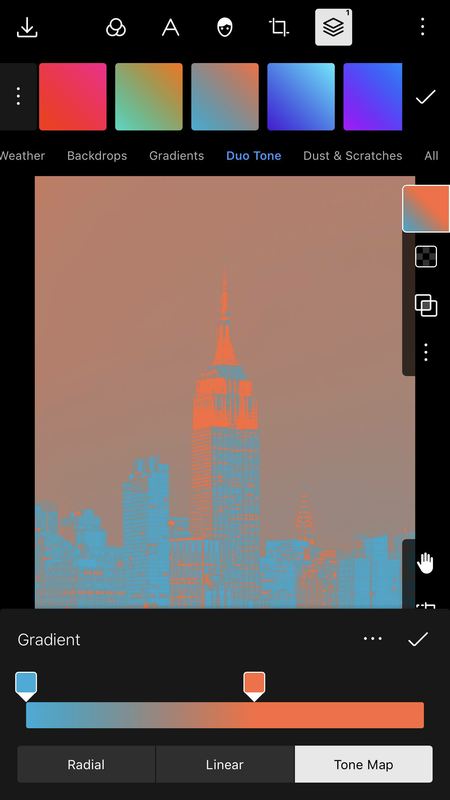 Specifically, it's adding more orange to the tones in the image that aren't quite shadows and not quite highlights, instead it's adding more orange to the midtones of your image. In addition to adjusting the two endpoints in a duotone color map, you can add or remove endpoints! What happens if you add another endpoint? We can add a purple endpoint in the middle of the color bar. You'll know notice that the midtones in this image are now mapped to purple. In the image,everything blue is a shadow, purple are colors in the middle, and the highlights are orange. 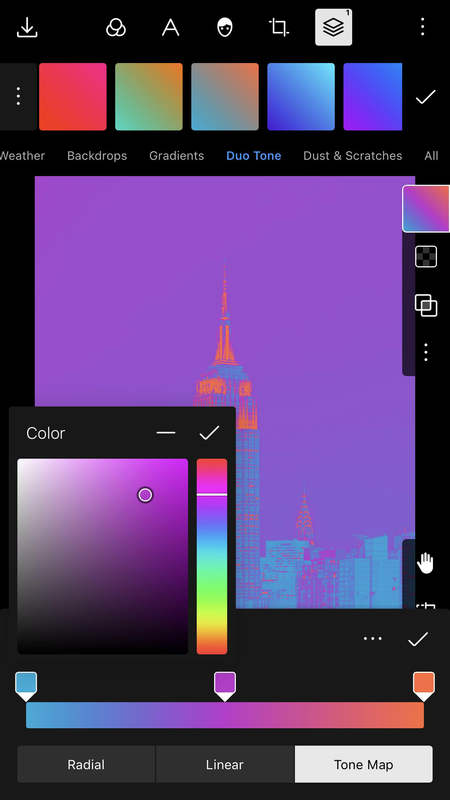 This is a powerful tool to easily make completely unique images. Here's what happens when you use the duotone tool and try out different blending modes. 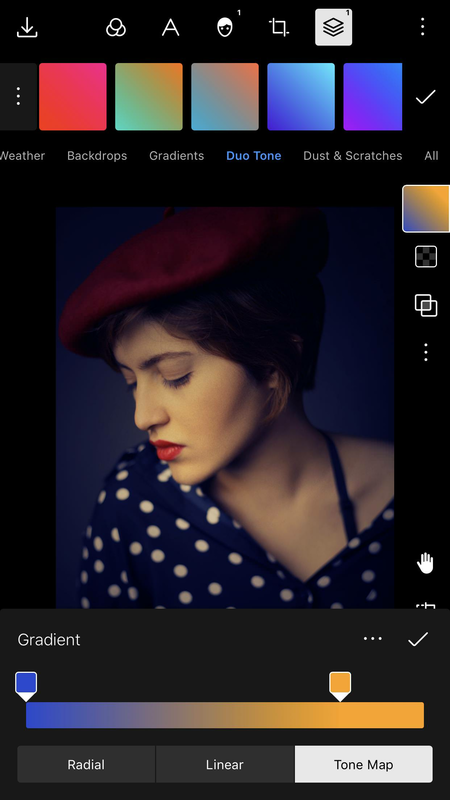 In this photo, we want our shadows to have a blue tone and our highlights to have some yellow. 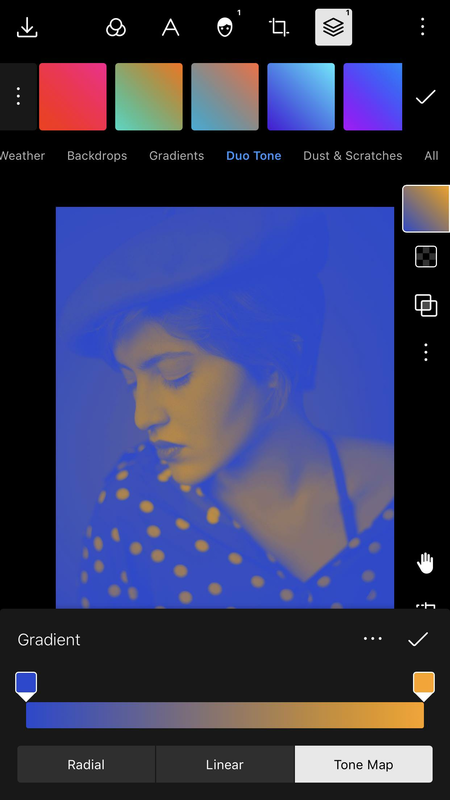 So we'll go into the duotone tool and select a gradient that goes from blue to yellow. Now, this is a cool image as is, but we want something that looks a bit more natural and not that extreme in terms of style. Here's what happens when we change the blending mode to soft light. At this point, you can see that the shadows in the image have blue in them compared to the original, while the highlights have more yellow compared to the original. We can move the endpoint of the yellow color to tweak the image a bit further. You'll now notice that the face, which has a lot of highlights, is now more impacted by the yellow of the duotone tool. This picture has kind of taken on an oil painting texture. It's pretty neat! 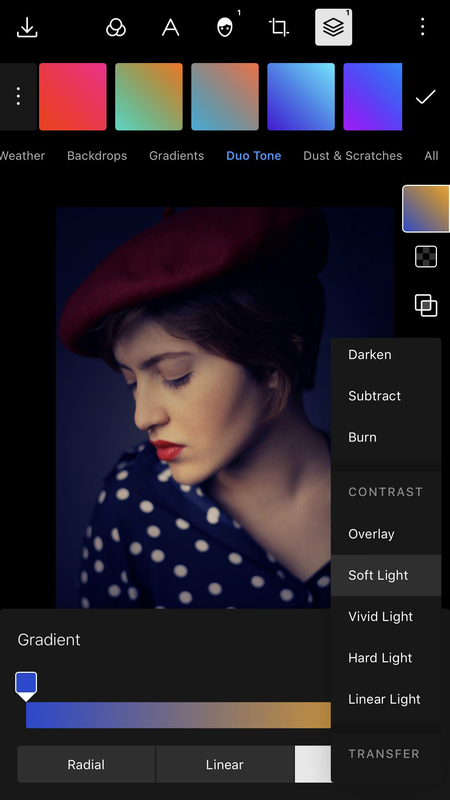 With so many different blending modes, how do you know which one to choose? We'll explore more of the different blending modes in the near future.